2015-16: As of April 26, 2016, Zane currently leads the team in singles and was recently nominated for a school-wide sportsmanship award. 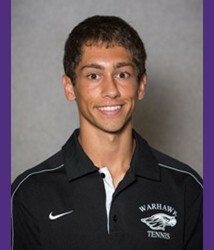 Nominated for the Male Rising Warhawk Award at UW-Whitewater’s annual Warhawk Awards. Tied for fourth on the team in singles wins with a record of 16-13 playing primarily at the No. 2 position. Totaled a mark of 13-6 in doubles playing primarily at the No. 2 position. On the No. 3 singles flight and, playing with Cam Laktash, the No. 2 doubles flight at the Warhawk Invite on Sept. 5-6 at Wangerin Courts. This entry was posted in 2014, Athletic Alumni by Dori Panthofer. Bookmark the permalink.